A shared passion by Ronen Mir, published in Dimensions, the ASTC newsletter, January 2005. An educational moment? by Leo Kadanoff, published in Physics Today, September 2006. Laboratorio | Arte Alameda, Mexico City. November 28, 2006 - February 11, 2007. 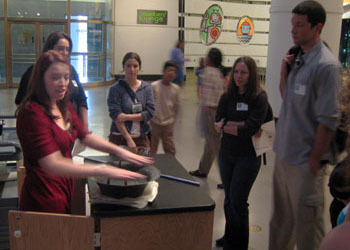 University of Chicago's Center for the Presentation of Science is an interdisciplinary program that teaches graduate students to present scientific knowledge to the public. MSCOPE is a collaboration between the University of Chicago, Museum of Science and Industry, Adler Planetarium and SciTech Hands-on Museum. Our goals are to develop compelling and informative science-based exhibitions, to bring new resources to the museums and universities, and to provide new career paths for students.